The Mullum Music Festival is almost here! Starting on Thursday 26th November till Sunday 29th November. Over 100 performances and workshops! The Mullum Music Festival has a great website with all the Artists listed with buttons that go to their websites and YouTube videos so you can check them out. “Every festival has it’s blue ribbon event. At Adelaide Festival it’s the opening night cabaret, at Melbourne Comedy Festival it’s the Gala Comedy night and at our very own Mullum Music Festival it’s the Opening Night Gala Performance. Spread over the 4 nights and three days of Surf, Music, Movies, Art and Lifestyle events, the Kirra SurfStock Festival was blessed with sunny weather, pumping waves, big crowds and has set the scene for a successful annual event. World title contenders Joel Parkinson and Mick Fanning made their presence felt on Friday morning at Kirra for a Live SEAFM radio outside broadcast with special guests Bob McTavish author of “Stoked”, new General Manager of Surfrider Foundation Kristy Theissling, Movie Man Tim Bonython and Surfer/Musician Lucas Proudfoot of Max Judo. There were many events over the 4 days including a free concert on Kirra beach with musical artists generously sharing their talents to bring back one of the best surf breaks in the world. One of the bands was The Genes and here’s a YouTube video from the concert. The Ukitopia Festival Opening Ceremony on Saturday was exceptional and I love watching the YouTube videos that I made about the Wishing Wall and Be the Love. Not only was there non-stop entertainment on the Main Stage in Uki Village all day on Sunday, the famous monthly Uki Buttery Bazaar was in full swing also. There were many interesting stalls and a line-up of entertainment and activities at the Buttery Market stage. The little village was packed with people keen to see and experience all that was on offer. 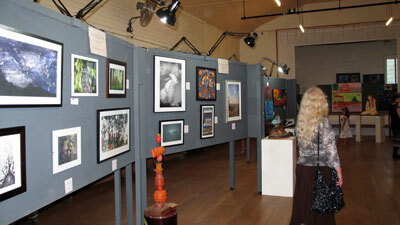 The Images of Uki Art Exhibition was most impressive and the Uki Primary School held their 1st Annual Eco-Expo. 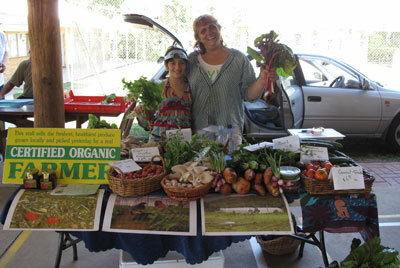 Zehvitt and her husband Avi from Bio Organic Farm grow certified organic fruit and vegies and have recently opened a stall to the public on their property at Byangum. 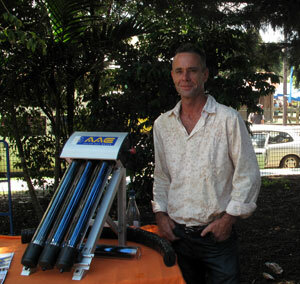 James from Solarwise Hotwater was glad to be in the shade and Mt Warning Spring Water next to him should have been doing a roaring trade as it was so hot! I learn’t a lot about the environmentally friendly and sustainable options available and was amazed at all the local businesses and groups there to share their knowledge. Free workshops were available throughout the day and the Uki Kids Club had activities for the kids. I spoke with the new Principal Jeff Robinson (who was once my son’s teacher) and he was very happy with the day and looks forward to it being bigger and better next year. 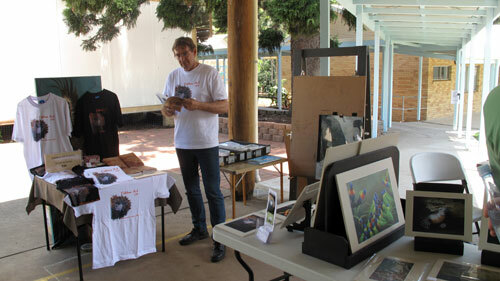 Caldera Art and the Rainforest Information Centre had a lovely display with art students working on their latest creations under the tutelage of Andy Reimanis. 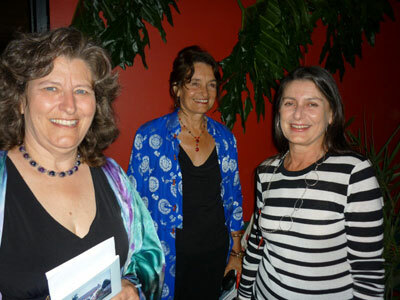 Mullumbimby Library invites you for Poetry and Tea. Dangerously Poetic Press is a community group from the Northern Rivers region of New South Wales, that encourages, publishes and promotes quality local poetry. Author Laura Shore is one of the main driving forces behind this organisation as she is very passionate about poetry and the written word. Laura is also very eloquent and expressive when it comes to poetry readings and fires up the audience with her enthusiasm! Dangerously Poetic Press have 2 upcoming poetry readings that are sure to be uplifting and inspiring. All the Way Home, Poetry From Byron Bay and Beyond. Check out the library’s free flowing poem. You might like to add a line. 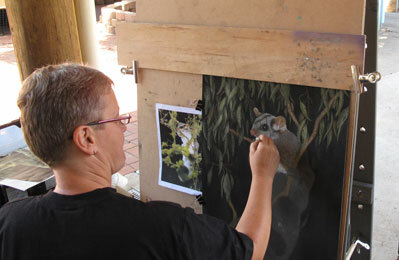 2pm Thursday November 19 Mullumbimby Library. Station St . Mullumbimby. This will be held at the Yogalates Centre in Bangalow on Sunday, the 29th of November at 3:30 pm. Our own local Irishman, Karl Farren will regale us with his original songs. Poetry on the Celtic theme will be performed by local actress, Susan Hayward and poet, Paul C. Pritchard. You are invited to share your favourite poem on the theme of celebration or a Celtic poem either classical or contemporary. Or share a poem you have written. Please bring a plate to share for afternoon tea. Pre-wrapped books perfect for holiday gifts will be available at sale prices as well as Karl’s cds so save some shopping for Sunday afternoon. The Ukitopia Festival is about celebrating all that is Uki. It was a beautiful start to the festivities with wishes from the community Wishing Wall being sent out to the universe. Armed with a hand held camera and no experience, I filmed some of the event and created my first YouTube videos. Through the dedicated and untiring work of Natascha Wernick , the Ukitopia Arts Collective and a team of local community groups, they served up the most engaging opening ceremony that set the stage for an extremely unique celebration of Uki life, arts and culture. Natascha and Sue lead a fabulous sing along with some of the local musicians weaving their talents into the colourful kaleidoscope that is Uki, and with the captivating Deya Dova and Loren lending their vocal talents, the crowd was spellbound and wanting more. Afterwards we were lead by Natascha to the hall for the opening of the Images of Uki Art Exhibition. When the door opened we were greeted with an amazing display of talent and imagination that filled the hall. The evening festivities had only just begun and things were hotting up with live music and DJ’s getting the crowd going off. Everyone was in a celebratory mood and I tell you, there was dancing in the streets!